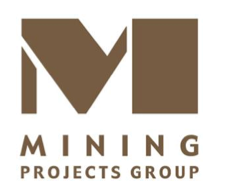 A highly conductive target has just been revealed by Mining Projects Group (ASX:MPJ) at its 100% owned Roe Hills Project. MPJ has also just secured the services of a new Nickel “Rock Star” acting as Technical Manager on the back of its recent exploration success. The renowned geology team working for shares at MPJ is now complete with the recruitment of Mr Steve Vallance – Ex Jubilee Mines Chief Geologist. In a career spanning over 25 years, Vallance has held senior roles at major names in nickel – like Xstrata, Jubilee Mines, Lion Ore/Forrestania Gold, Western Mining Corporation, Energia Minerals and Australian Consolidated Minerals. Vallance has taken projects from greenfield exploration through to successful mining operations – a great addition to the MPJ team as they advance their nickel exploration efforts. Just like all the other key technical staff at MPJ – Neil Hutchison and Newexco – Vallance will be taking a combination of cash and equity for his services. It’s what MPJ have learnt over the last few months that has sparked his interest in the company. Vallance was impressed by MPJ’s rapid confirmation of a fertile nickel belt, which features several zones of massive and disseminated nickel sulphides. The task ahead for the new, beefed up nickel team is to locate an economic accumulation of nickel. 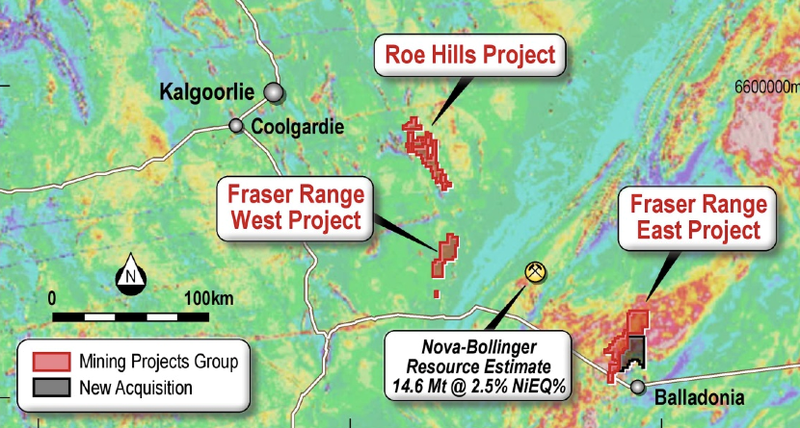 For those new to the Mining Projects Group (ASX:MPJ) story, we first invested in the company last year and outlined its nickel ambitions in Nickel Rock Stars Working For Shares: Twiggy’s # 1 Geologist Plus Sirius Masterminds Combine in One Fraser Range Micro Cap. 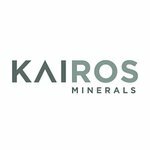 Newexco – pre-eminent geophysicists who most recently aided Sirius with their Fraser Range discovery – but that’s just the latest in a long line of success from the Newexco team. Newexco obviously like MPJ’s ground and are taking partial payment in MPJ shares. Mr Neil Hutchison – MPJ’s Technical Non-Executive Director, the General Manager at Poseidon Nickel, who made a big find at his first year there – the biggest discovery for Poseidon since 1971 – the 68,000 tonne Cerberus nickel deposit. He is also taking partial payment in MPJ shares. Mr Steve Vallance – the latest addition to the team – as discussed above – again, taking part equity in MPJ in exchange for his services. With these guys invested in MPJ for its discovery potential, and at the same time driving the exploration forward, we believe MPJ are heading in the right direction. 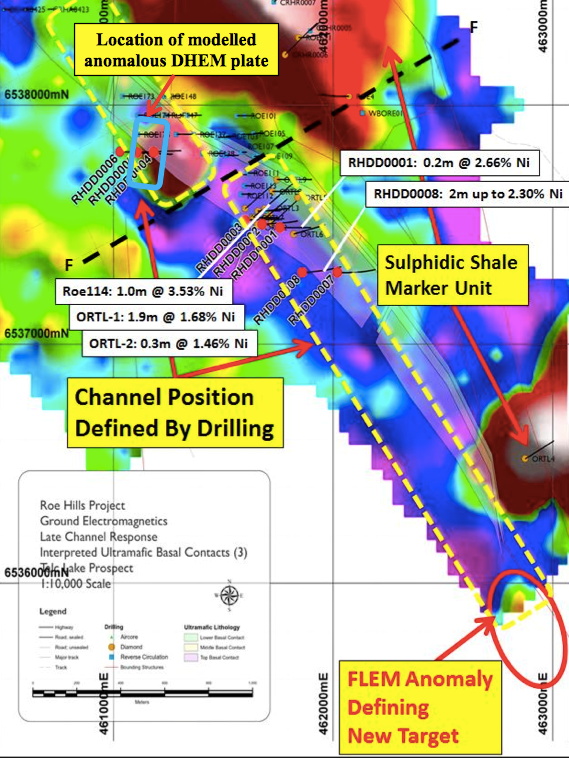 The latest from the ground at the Roe Hills Project is the identification of a highly conductive target that was picked up from recent down hole electromagnetic surveys at the Talc Lake Prospect – a major southern prospect within the Roe Hills Project. This breakthrough is another step toward what is hopefully the company’s first major nickel discovery – its early days and no sure thing, but the Technical team appear to be very positive about MPJ’s ground. MPJ has just closed a fully underwritten rights issue for $1.6M, and this will go toward accelerating an immediate follow up drilling programme, along with a major regional fixed loop electromagnetic survey over its entire 40km strike of ‘ultramafic horizon’ – that’s geologist speak for ‘nickel bearing rocks’! So in the coming months we should see drill bits turning and scanners burning at MPJ’s Roe Hills Project... plenty of activity to keep us on our toes. MPJ is applying a “cabbage leaf” exploration model at Roe Hills – where lava channels spread across the earth and drop out nickel sulphides as they go. This same cabbage leaf model was used to discover the Cosmos, Prospero, Sinclair, Cerberus, Silver Swan and Camelwood nickel deposits in the Kambalda region of Western Australia – generating billions of dollars collectively for the companies that found them. In any case, the key to a discovery is tracking the ancient lava flow in the region – follow the flow and you may find nickel. Just four months ago, MPJ identified Massive Nickel Sulphides at the Talc Lake Prospect and recently intersected disseminated nickel sulphides at the previously uninterpreted Roe 1 Prospect. But lets cover all the latest news in the rest of this article. 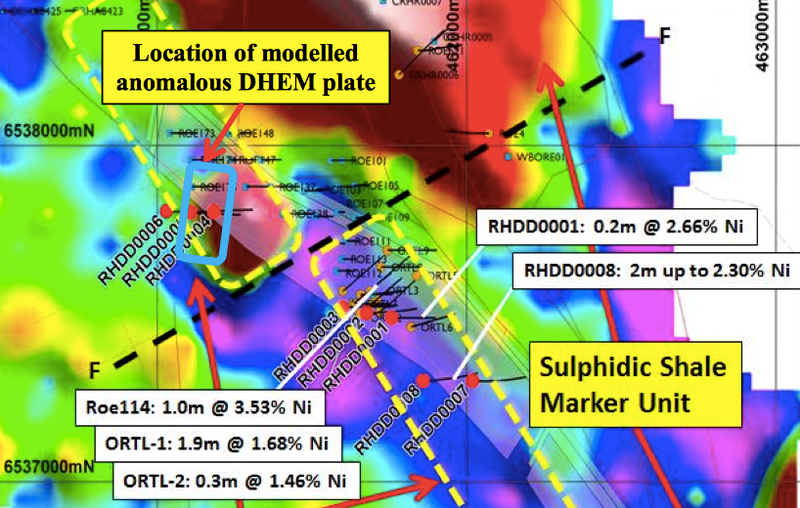 Good results – but now a series of down hole electromagnetic (DHEM) surveys in the drill holes have revealed something MPJ are very interested in – a highly conductive target. Recent drill holes have now been tested with Down Hole Electromagnetic Surveys and MPJ has detected a highly conductive target right in the middle of them. The modelled conductor was identified from samples taken from drill holes RHDD004 and RHDD005, seen to the far left of the image below. Results from further drill holes RHDDs 0006, 0011 and 0012 are also due imminently. The DHEM survey results so far show the identified conductor is close to the area’s ultramafic rocks and in line with the plunge direction of the lava channel which is open to the north. 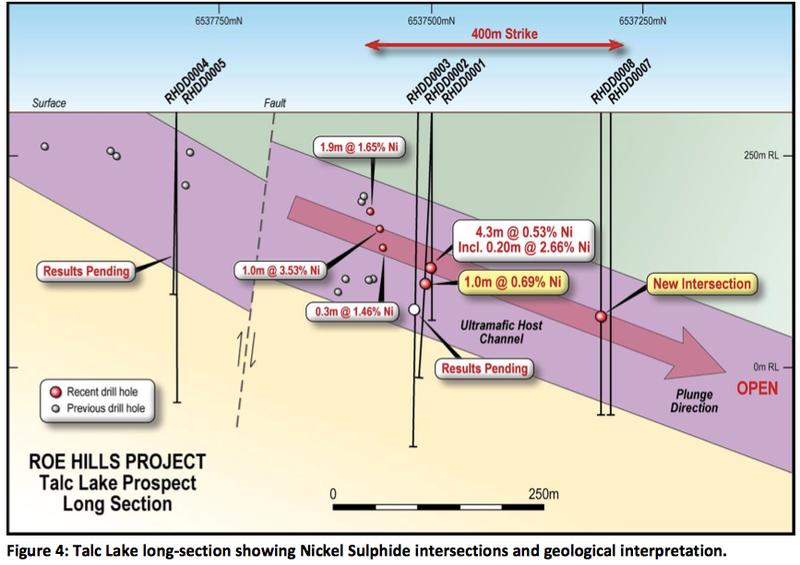 Drilling has now defined nickel in all three stratigraphic diamond hole cross sections sunk into the Talc Lake prospect, covering an area of 875m. Regular readers of the Next Tech Stock will be familiar with our long-standing interest in high potential stocks. 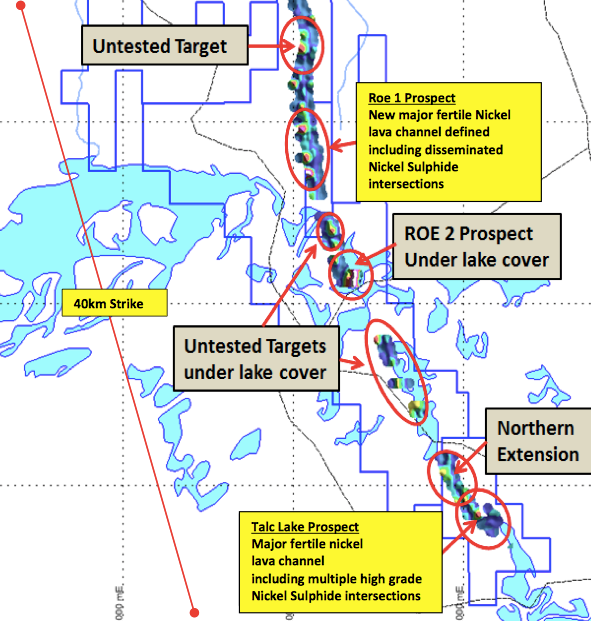 With this promising conductive target at Talc Lake now in play, MPJ is planning an immediate follow up drilling programme for high priority targets there. 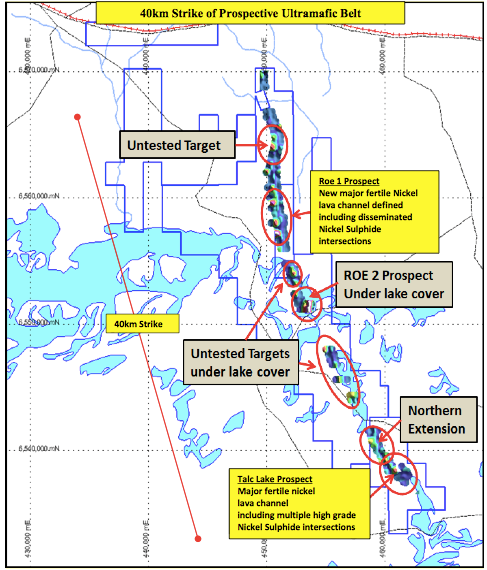 In the image above you can see the existing diamond drill holes in purple, blue and black with MPJ’s proposed future drill hole in red – right through the bullseye of the target zone at Talc Lake. This methodical and scientific approach could soon yield strong results for MPJ – and we expect to see details of the imminent drilling campaign soon. In addition to upcoming drilling, MPJ is getting set to conduct a Moving Loop Electro Magnetic (MLEM) survey over the entire 40km strike of its Roe Hills Project area. In the image above you can see the Talc Lake conductive anomaly at the top boxed in blue, and the lava channel defined by yellow dashes. That lava channel flows toward another anomaly target defined through data from Fixed Loop Electro Magnetic (FLEM) surveys. The lava channel conforms to the Kambalda ‘cabbage leaf’ model MPJ is following. The upcoming MLEM survey will follow this first channel to define more prospects while also looking for more nickel avenues across the wider area. Looking ahead, the most prospective of the targets generated by the MLEM will be drilled as a priority, so we could see MPJ drilling throughout the remainder of 2015 with a chance of hitting significant mineralisation each time. But like any discovery it takes patience – and more drilling, and that’s exactly what it’s going to do in the coming weeks and months. As long-term shareholders in MPJ, we at The Next Small Cap are impressed with the company’s methodical progress. It’s making all the right moves with the experienced Technical team leading the charge. To fund all of this exploration across its Roe Hills Project, MPJ is now in a good position after it closed a fully underwritten rights issue for $1.6M . MPJ held a non-renounceable pro rata rights issue for one new share for every five existing shares held for $0.006 cents per share. This came with one free attaching listed option for every new share subscribed. The rights issue will raise a total of $1,637,000 before costs and had a shortfall of 250,200,987 new shares and 250,200, 987 free attaching options. These will be allocated to Alignment Capital, who underwrote the issue. Drilling and surveying are on the cards right now for MPJ. In the next few weeks we should see MPJ begin an MLEM survey covering the entire 40km of strike it’s worked up at its Roe Hills Project – going from the nickel mineralisation of the Roe 1 prospect in the north to the conductive anomaly at Talc Lake in the south. The MLEM survey could find more nickel prospects, identify new lava channels, and generate further genuine targets for MPJ to drill. 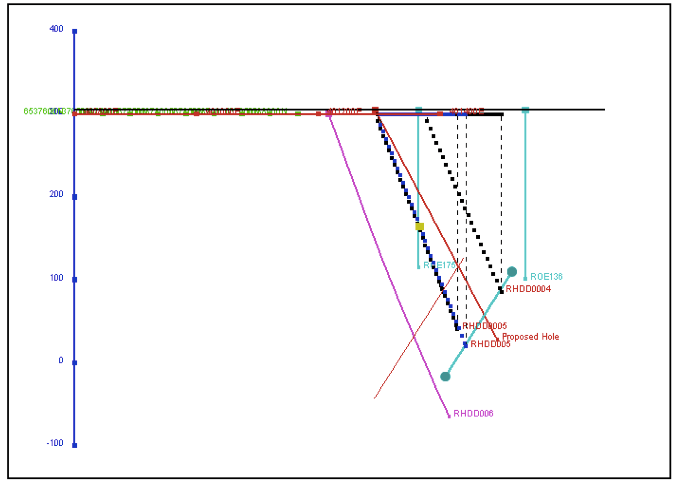 All of this will happen as MPJ prepares to conduct follow up drilling at the Talc Lake conductive target to see what it has in the ground – we are hoping for more nickel!